Women who worked as models were frequently seen as passive, silent beauties, discovered by artists and then delivered onto the canvas. In fact, they had a good deal of active intelligence and ambition. They were usually from lower middle and working class families, and had to use whatever gifts and talents they possessed to best advantage. 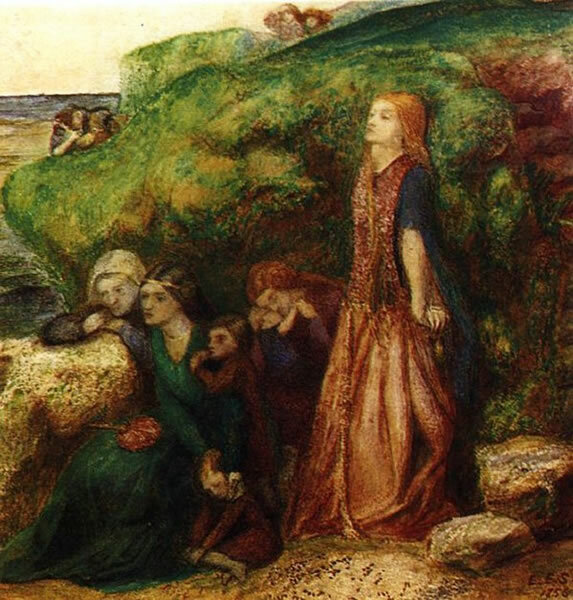 Though less clearly successful than their male compatriots, many of the women were active artists in their own right — Siddal and Marie Spartali Stillman, for example. 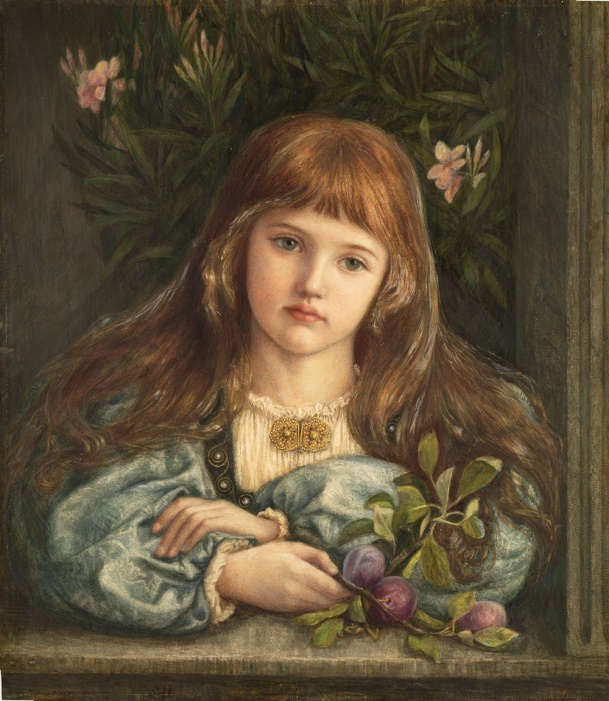 La Pensierosa by Marie Spartali Stillman, 1870, a painting that inspired the image of the child in House of Lies. 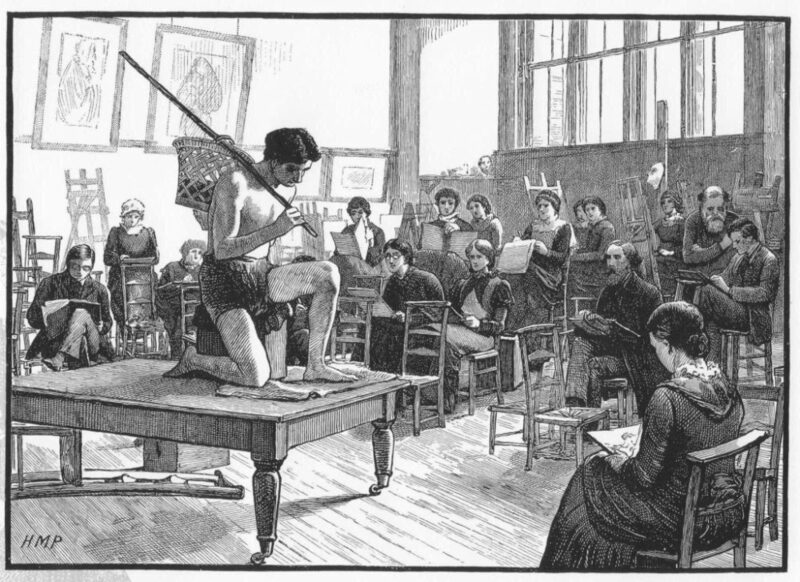 For most of the eighteenth and nineteenth centuries, art education and professional recognition for women remained separate and unequal to that of their male peers. In the last years of the eighteenth century, the prestigious Académie des Beaux Arts in France limited female membership to four. In England, the Royal Academy of Arts had only two female founding members. Not until the second half of the nineteenth century did women artists make significant progress when more art schools opened their doors to women, prominent dealers represented them, and public institutions acquired their work. The Royal Academy Schools finally admitted women in 1861, but female students initially were only allowed to draw draped models. However, other schools in London, including the Slade School of Art proved more liberal. By the end of the century, women were able to study the naked, or very nearly naked, figure in many Western European and North American cities. One reason why nineteenth century female artists have been rendered well-nigh invisible was the prevailing Victorian view of womanhood. The passage that follows is from Elegant Arts for Ladies published by Ward Lock in 1856. A woman’s accomplishments are a way of keeping her from boredom; they are not to be taken seriously, and this includes any light sketching — if it were allowed. 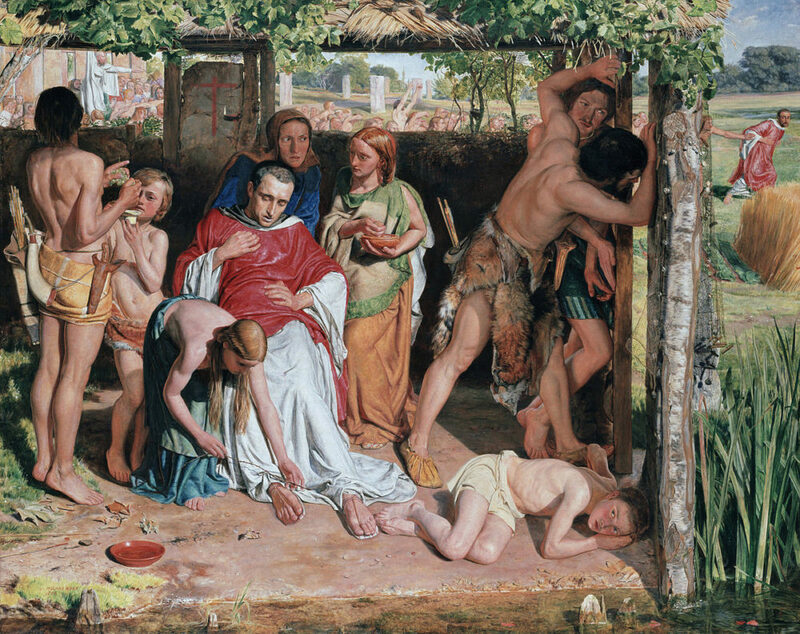 A visualisation of the same sentiment can be seen in Stanley Baldwin’s painting a year later. Sketching from Nature by Stanley Baldwin, 1857. The stereotype was able to persist because many middle and upper class families felt that learning art was a waste of time for young girls and clashed with the interests they should be pursuing in music and French. Ladies might draw — a feeble skill was acceptable — but they must not draw well since this was judged unfeminine. Notions of femininity explain the delicate, dabbling figure above whom it’s impossible to take seriously as an artist. Femininity was a major requirement of the ideal Victorian woman. Whatever a woman’s wishes in mid-Victorian society, she was required to be and to act in a certain way, and a place was found for women in art only if they fitted notions of an archetypal womanliness. Qualities that did not fit this archetype were labelled ‘masculine’ by critics, and any woman who expressed such qualities was effectively desexed. Any challenge to the stereotypical image of woman, and therefore of woman’s art, put the artist beyond the pale. Baldwin’s sketcher above was not expected to display her work — except for the approval of eligible bachelors — nor to sell it. And since showing and selling went together, she would not exhibit. Nearly all shows of artwork were underpinned by commercial considerations, and it was thought highly unbecoming of a lady to earn money from any of her activities. Indecorous, too, to draw attention to herself in any public sphere. 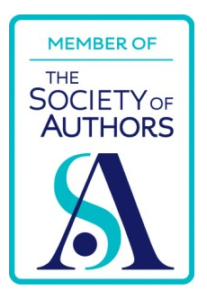 Sophia, my Victorian heroine in House of Lies, dreads discovery that she has sold her work under a male name. It was possible to exhibit as an amateur, but this was not considered serious art. The amount of work by female artists seen by the public at the Royal Academy and other institutions was only a small proportion of the work that women were, in fact, producing. A combination of modesty, lack of encouragement, and the fear of commercialism, destined their work for the album or the parlour walls rather than for the exhibition-room. 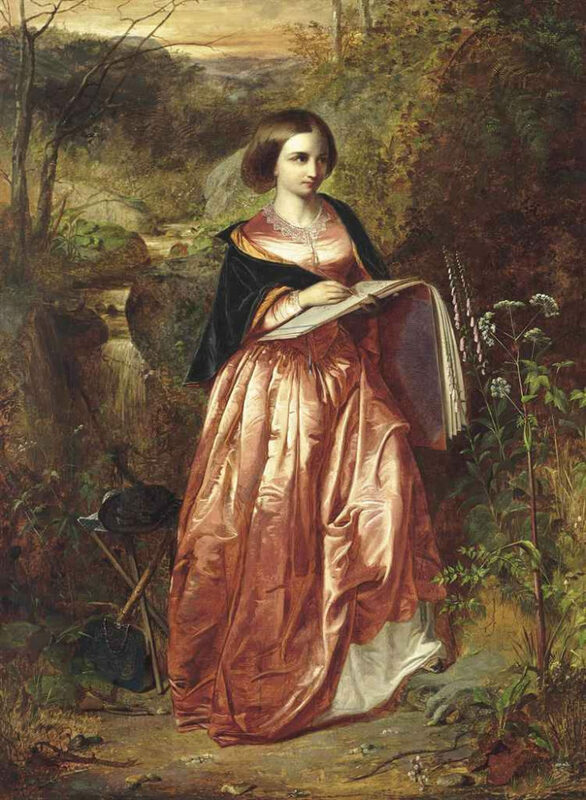 The Ladies’ Lament from the Ballad of Sir Patrick Spens by Elizabeth Eleanor Siddall, 1856.